Raúl is a Uruguayan Navy retired Commander, Merchant Navy Captain and Yacht Captain. He has commanded several vessels during his naval career and served on sail training vessel Capitan Miranda since her beginnings as a Uruguayan Navy Sail Training Ship. He also held positions of Navigator, Chief of Sail Manoeuvre Department and Executive Officer, and has participated in numerous Tall Ship Races. 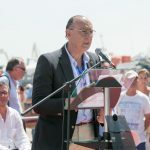 Living in Spain for 20 years, he is the Spanish Sail Training Association Board Secretary and STI’s national representative. He frequently takes part in yacht races and maritime events.